Back when I was a college kid working in Glacier, I made fairly regular trips into Kalispell ... errands, a movie, pizza and beer, whatever. 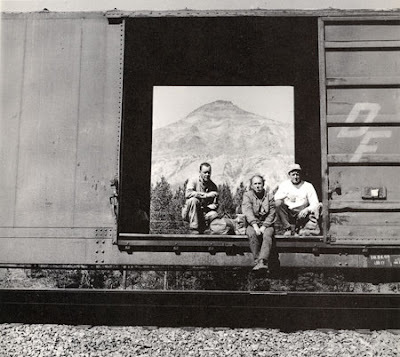 For some reason, on one of those excursions I ended up at the public library there, where I came across a book of evocative photos of freight-train-hopping hobos. A number of the images were taken in Montana, and they stuck in my mind for a long time afterwards ... to the point where I finally decided I needed to find myself a copy of the book. And I'm pretty sure I found it: a little volume called Riding the Rails, by a photographer named Michael Mathers. Here's one of the shots I remembered. Though it was certainly a hard existence, there's also a lot of romantic appeal in the mythic life of a hobo, and I definitely felt that. I don't know if the photos in that book influenced my own freight-hopping misadventures from those years, but I wouldn't be surprised.